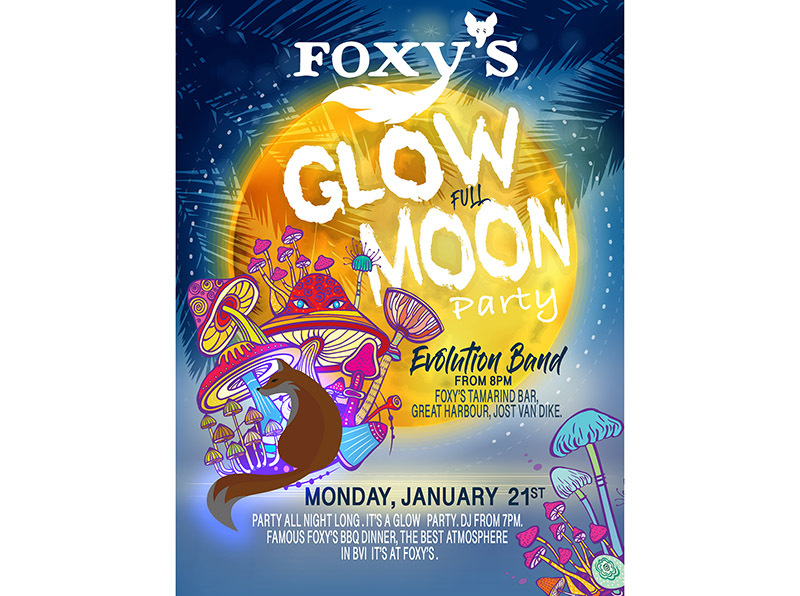 FOXY’S 2018 CAT FIGHT: A HIGH SPIRITED EVENT DESPITE LACK OF WIND. 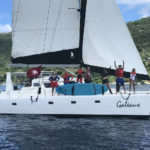 October 27, 2018 — It’s 11 a.m. and we are drinking Bloody Mary’s on the deck of “El Gato” a 37 foot luxury power catamaran that typically operates day tours out of St. Thomas. Today the vessel has been transformed into the (most comfortable) Committee Boat for Foxy’s 2018 Cat Fight Regatta, thanks to the kindness of owner and friend Scott Barber and his girlfriend Kristen, who is the vessel’s mate (and maybe more importantly, the maker of the delicious Bloody Mary’s). We are anchored off of Great Harbour and 16 boats sail in circles just off our stern, waiting for their starting signals. Up on the fly bridge, members of the West End Yacht Clubs are busy with horns, flags and announcements over the VHI as they get all racers underway for the regatta. In addition to the usual West End Committee members, Chris Curran and Glenn Ashmore, who are members of the online travel forum www.traveltalkonline.com are also onboard lending a hand (and drinking a few drinks and maybe napping in bean bag chairs in between). Each year, friends from “Travel Talk” organize themselves for the event. 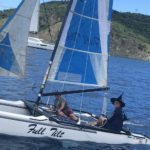 This group of perpetual BVI visitors help draw a larger number of participants to the Cat Fight each year and help build the camaraderie and spirit of the Cat Fight. 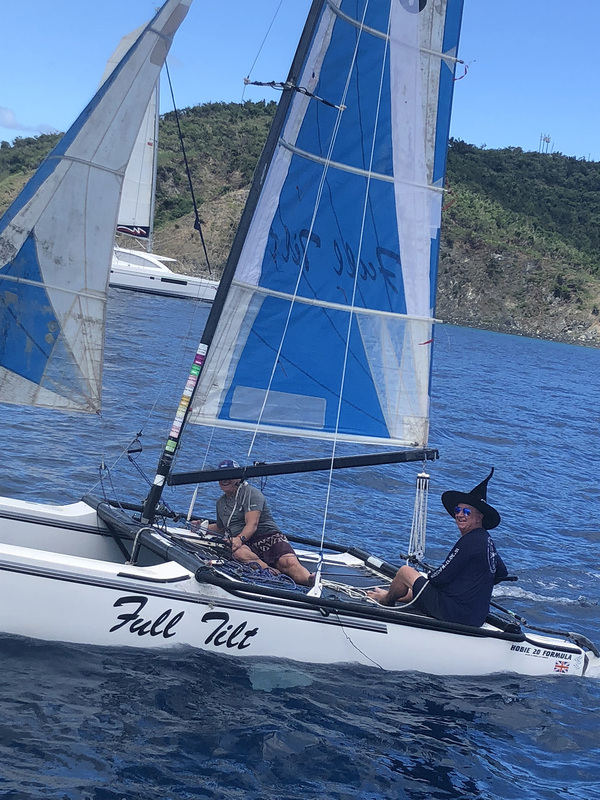 The friendly, laid-back atmosphere is a part of what makes this race so much fun (though don’t be fooled, there are definitely a fair share of serious racers in the mix at this Regatta). 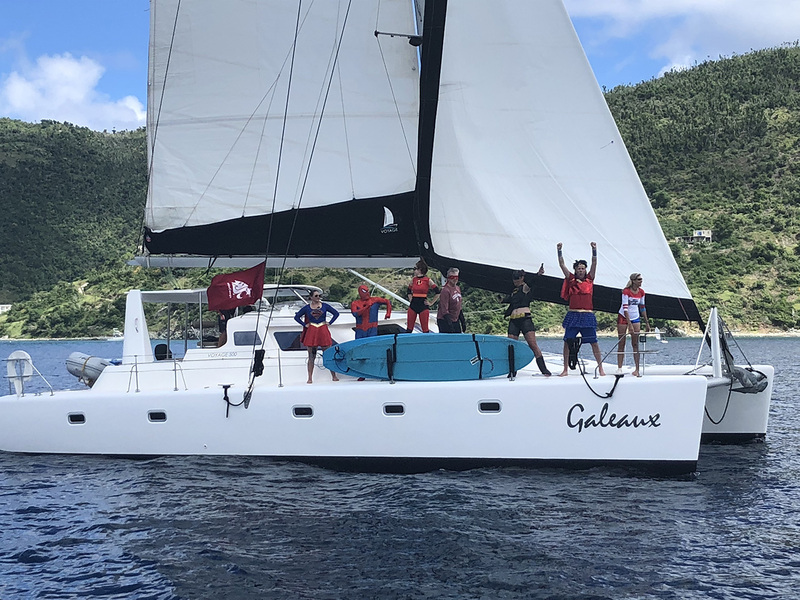 The Voyage Catamaran “El Gateaux” sails past the start line cheering, and the race committee members whistle and shout back when they see the crewmembers on deck, all dressed as Marvel Comics’ super-heros in support of the event’s Halloween theme. A few minutes later, it hardly seems out of place when a Beach Cat sails past with the skipper sporting a witch’s hat for sun protection. It’s a fun day on the water, even though race conditions are fare from optimal. The skies are a brilliant blue and the seas are so flat that you can almost see the seafloor from our anchor in 50’ feet of water. The flat calm conditions were also accompanied by winds that only averaged 0-2 knots all day, with gusts up to a whopping 4 knots. 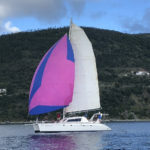 The approximately 7 nautical mile triangular race course, which ran from Great Harbour to Great Thatch Island, over to Sandy Cay and back to Great Harbour took approximately 6 hours for most vessels to complete, due to light winds. Boats even reported drifting backwards or into each other. Due to poor race conditions, only 6 stalwarts of the total 16 entrants were able to finish the race. Mount Gay Rum and local food and beverage distributor Road Town Wholesale were the official 2018 sponsors. 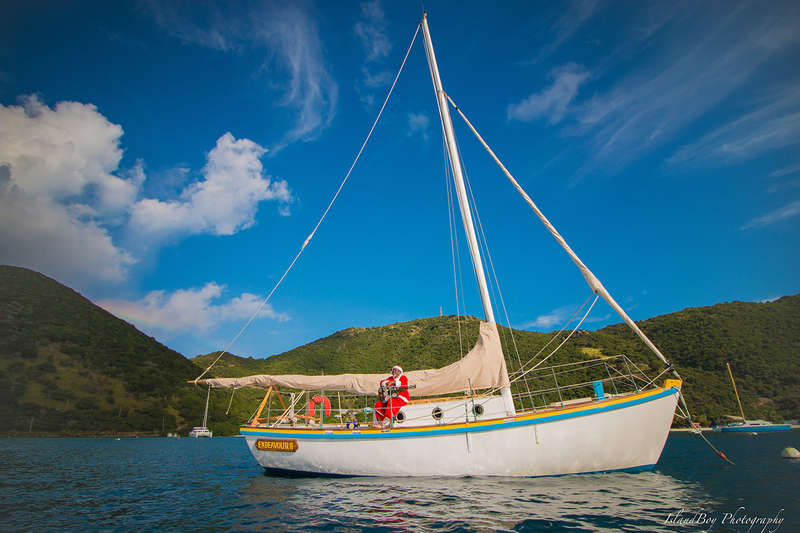 A case of Mount Gay rum was awarded to s/v “Sail Pending who earned the title of “Baddest Cat” for the event. 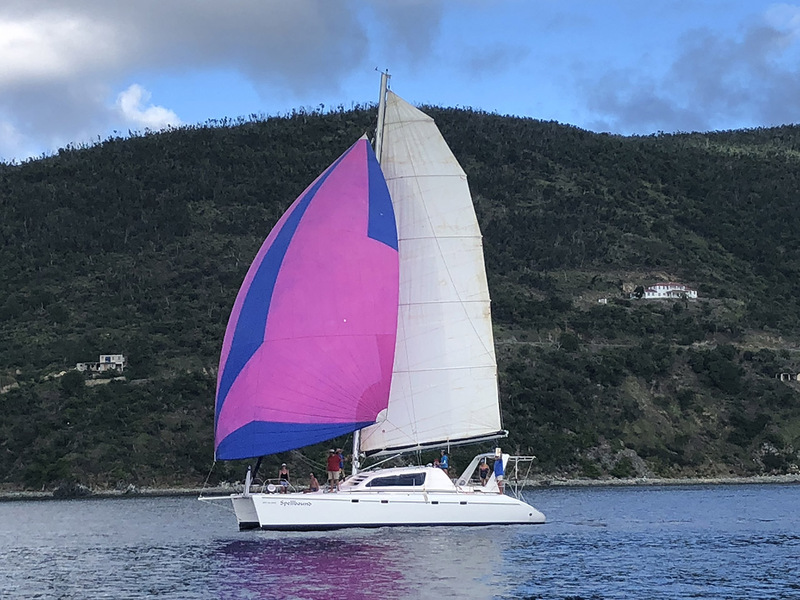 As is tradition with West End Yacht Club, all vessels that completed the course received prizes, which included gift certificates from local BVI restaurants. Every entrant received Mount Gay Rum and other goodies. The regatta followed the typical West End Yacht Club/Foxy’s formula: One part race, one part party. If you drink enough rum, everyone forgets that there is no wind and leaves with great memories. 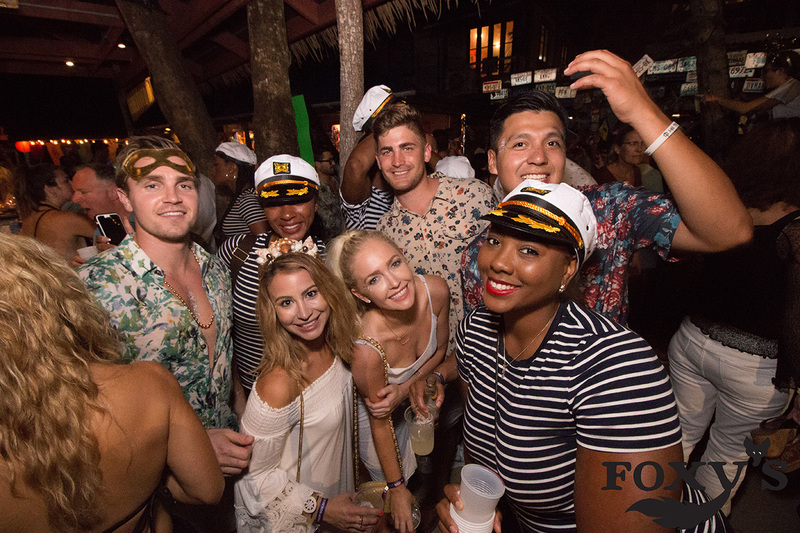 Following the race, Foxy’s hosted its Halloween “Masquerade Ball” featuring a costume contest, Foxy’s famous Caribbean Beach BBQ and live music by Final Faze. In addition to race participants, a few hundred people were in attendance. The 2019 Foxy’s Cat Fight is scheduled for Saturday, October 26, 2019. 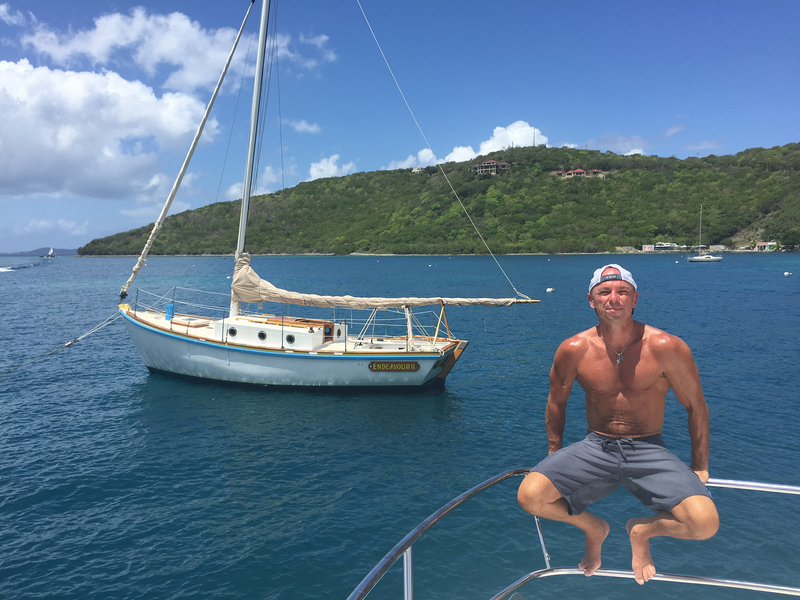 Inquire with your favorite BVI charter company about rates for next October.